LONDON, England (CNN) -- A British executive who says he was sacked because of his beliefs about climate change is defending his right to make a claim for unfair dismissal against his former employers. Tim Nicholson claims he was sacked for his views on climate change. 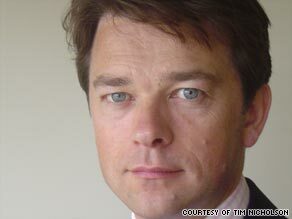 Tim Nicholson, 42, was employed by UK property company, Grainger as head of sustainability from 2006 to 2008. He says that his views on climate change and the environment are so strong that they led to clashes with senior staff at the company. At a pre-hearing review in March 2009, employment judge David Sneath granted Nicholson permission to make his claim for unfair dismissal under the UK's Employment Equality (Religion and Belief) Regulations which came into force in 2003. Nicholson's solicitor, Shah Qureshi told CNN: "We feel that there are strong arguments as to why Tim's views would amount to a philosophical belief. If they do, it would mean that people with those views about climate change and how it will affect the world, they will be protected under the UK's discrimination laws." But his former bosses disagreed with the decision and are challenging it on the basis that Nicholson's beliefs about climate change are not philosophical but scientific, and are therefore not covered by the legislation. The UK's Press Association reported that at an Employment Appeal Tribunal which convened in London Wednesday, Grainger's lawyer John Bowers said: "A philosophical belief must be one based on a philosophy of life, not a scientific belief, not a political belief or opinion, not a lifestyle choice, not an environmental belief and not an assertion of disputed facts." "The philosophical belief in this case is that mankind is heading towards catastrophic climate change and that as a result we are under a duty to do all that we can to live our lives so as to mitigate or avoid that catastrophe for future generations. We say that involves a classic philosophical and ethical position," Rose said, according to PA.
She added: "You cannot give less protection to beliefs founded on science that to beliefs founded on faith." Nicholson claims that Grainger's chief executive Rupert Dickinson showed "contempt" for his concerns and on one occasion flew a member of staff from London to Ireland to deliver his BlackBerry handheld device. Efforts by Nicholson to set up a carbon management system at the company were thwarted when the human resources and accounting departments refused him access to the necessary data, PA reported. Nicholson -- who was made redundant by Grainger plc last year -- told the previous hearing in March that his views on climate change affect how he lives his life. He said that he did not travel by plane anymore and had adopted a more eco-friendly lifestyle which included buying local produce, cutting his meat consumption and making his house more carbon efficient. "I believe we must urgently cut carbon emissions to avoid catastrophic climate change," PA reported. The hearing ended yesterday and a judgment is expected to be handed down in a few weeks.